Since 1988, the Honors College has participated in the National University Model Arab League (NUMAL) conference, held in Washington, D.C., each spring. The league offers students an excellent opportunity to develop leadership skills and to learn about the social, economic, cultural, and political issues facing leaders of the Arab world. Participation in MAL is valuable to students of all academic majors and nationalities as they gain valuable leadership training through public speaking and discussion, writing and editing, interpersonal relations, and cross-cultural dialogue. Delegates come away with practiced skills that will serve them well in their future endeavors. Interested students should contact Keri Myrick, Adrian Castillo, or Julia Hess. In fall, 2017, the Model Arab League team competed in their first ever international competition. The Cairo International Model Arab League conference took place over Thanksgiving break, and the participants had much to be grateful for: The team collected a total of 11 awards. Model G20 (MG20) is an innovative program designed to fully simulate a G20 Leaders' Summit. Recognizing the G20’s influence in shaping today’s world, we seek to prepare future leaders to build a strong, sustainable, balanced, and inclusive global economy. MG20 helps students develop skills in multilateral negotiations, public speaking, team building strategy, and diplomacy. A closer look at the inner workings and agenda of the G20 provides participants with a better understanding of the dynamics of international affairs, including such key issues as economic growth, job creation, migration, refugees, trade agreements, financial regulation, development, climate change, and others. For more information on MG20, please contact Keri Myrick, Adrian Castillo, or Jackson Crawford. The inaugural MG20 Summit took place at the American University in October 2017. The University of Houston delegation representing the United States took the top honor of Best Delegation. The UH delegation representing Saudi Arabia earned an Honorable Mention. 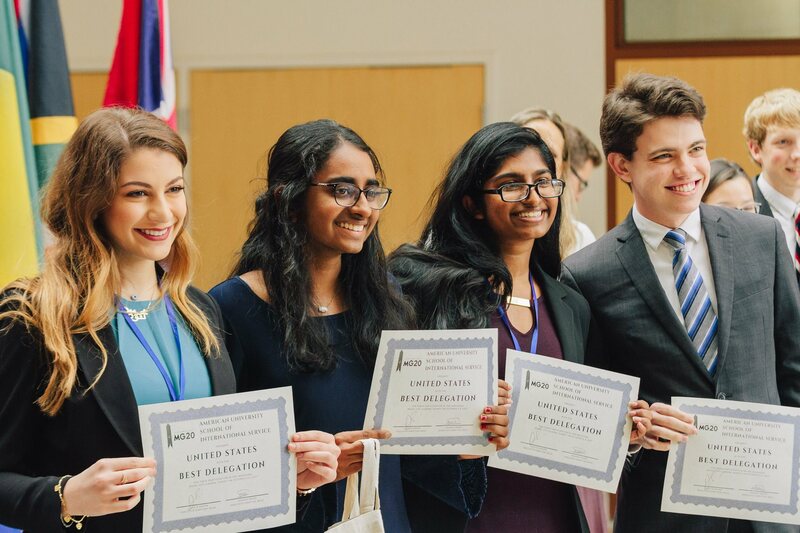 Model United Nations (MUN) is a program designated to educate students of all ages about becoming aware of current events, international relations, as well as being open minded and respectful towards different cultures around the world. Model UN participants will gain a deeper understanding and appreciation of how different countries cooperate with one another in order to put an end to world problems such as eliminating famine, protecting human rights, providing basic necessities of life, preventing or ending armed conflicts, as well as many others. For more information on MUN, please contact Keri Myrick, Adrian Castillo, or Pierre Schlaefli.